I said I would give something away when I broke 5000, and that happened today! 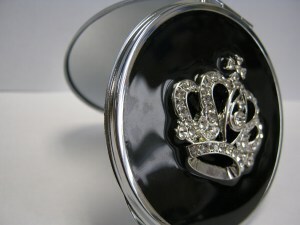 I’m giving away this compact mirror that includes a special note from me. This is one of my favorite things that I take with me everywhere! 1) Subscribe to this blog through the link to the right before the day is over (Nov. 9). I never spam, and I will never share your email address with anyone. 2) Post a comment on THIS POST and tell me you want to be in the drawing. You will see a place below this post that says leave a comment. Let’s get a lot of people involved. It’s not fun to have a drawing with just a few people! 🙂 This would be a great stocking stuffer! I would love to be included in the drawing for the mirror. Thanks for what you do, all girls deserve to know they are beautiful to their maker. Congratulations! I would love to be in the drawing. Congrats !!! God is good!!! I love this Misty! I would like to be in the drawing.